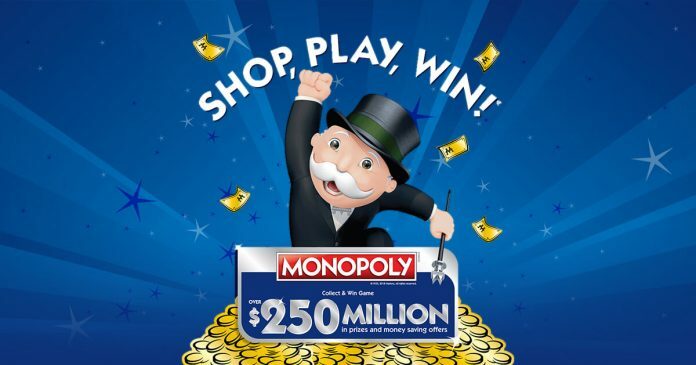 The Albertsons Monopoly 2019 is on and you can now play at shopplaywin.com. This also means that you have about 3 months to collect as many Albertsons Monopoly pieces as you can to fill the Albertsons Monopoly game board 2019 for a chance to win prizes. Among all these game tickets are the Albertsons Monopoly 2019 Rare Pieces. You know, the hard to get pieces? If you are playing the Monopoly game for years, you probably identified some of them already. However, if you are a new player, you may be wondering what are the rare monopoly pieces and this is where we can help you. What Are The Albertsons Monopoly 2019 Rare Pieces? Below is a list of all Albertsons Monopoly Rare Pieces 2019. Be sure to come back every time you get Albertsons Monopoly pieces to find out if you got rare ones. Do you have information regarding the Albertsons Monopoly rare pieces? Let us know in the comments below and we will update this post accordingly. The Monopoly Albertsons runs from February 6th to May 7th, 2019. Good luck! I have 8z07g! Rare 1,000,000 piece! Hello, I was wondering if you have the game piece available. Im interested if you want to part with it! I have 9A04C one of the rare ones for the $10,000 4 wheeler. I dont have the need for a four wheeler…so if someone has 03 and wants to make an offer…I am open. I have 8E85E for the 100k or luxury car, let me know if you have B! we can split! What is the chance of winning any prize with 65 pieces? 20,000 college tuition, I have 8B99D (rare piece) can include A & B as well. Please put title: Over here Monopoly! I need 8e82b and 8e85e and we can split! I also have the 8Y16H I am fairly certain with the number of people in the comments that have it that it is much less rare than the 8Y14F. I have the rare 8E85E and am looking for 8E82B to split. I also have the rare 8C93C and need or will trade to get 8C91A. Contact me at tamaradudas@yahoo.com. Thank you! No Spam Please. Need 8E82B “$100,000 cash/luxurary car”. Wanna trade, contact through email: nitawael@gmail.com, (please no spam). I have rare 8C91A and need 8C93C. To my surprise, I just opened 8B99D simi-rare for the college tuition. If anyone is interested in buying let me know. – jamescpk@yahoo.com. Hi there! My name is Andrea and I have piece 8C91A, so hoping to connect with someone who has 8C93C. I understand your piece is more valuable than mine, so happy to split in a way that is more favorable to you! I can be reached at andreakaraadler@gmail.com or 617-504-8959. Looking for a 9C15B. If you have it, I can give you a 9F25B ($10.00 grocery gift card), 8D90E (Home Makeover) and a 8W23C ($25.00 Grocery Gift Card). P.M. @ Vegasghostga@cox.net. No spammer please! have 8e85e! ready to split with anyone who has 8e82b! I have 8c91c rare piece. I need 8c93c rare piece. Lets make a deal. I have all of the million for 2018 but the last one ending in AH. I have several game pieces which only have one or two left to win. Contact me at mstanyataylor@gmail.com if you want to talk strategy. It’s amazing that some persons have so many tickets, including the rare and simi rare ones. The game started only 12 days ago. And it will be interesting to see how many emails I get that are not related to the game. I just need 108AH… If someone has, I will share winnings! I have 116BH for the vacation home. Wondering if anyone has the 110BB? I have the 116BH piece for the $1,000,000.00 vacation home, also have the 181TA piece for $100,000.00 cash. If someone has the 110BB piece, or the 182TB piece, please email me, let’s talk. I have 194wd ,email me at Langit98@gmail.com if interested. I will give you 60% of the $1M if you have 108AH. Let’s meet ASAP! If you have 108AH I am ready to give you 60% or beat best offer. I have all others. Let’s meet ASAP! I have 200XE if anyone has 199XD and wants to split or buy me out? I have a RARE 209ZC anyone with 207ZA? I need 179SC, 173RA, 166PB, 145KA,164OD, 159NC, 154MB and wants to split. PLEASE EMAIL ME sarmelin07@gmail.com. What does it mean when it says, “prize clipped to your rewards card”? As far as I know, I do not have a “rewards card” and I don’t know how to claim my prize.